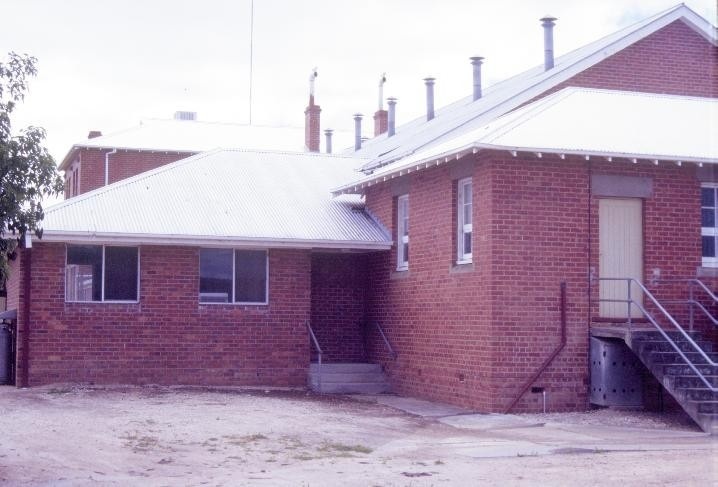 The municipal building at Jeparit was a combined effort of the Mechanics Institute, the Returned Sailors and Soldiers Imperial League of Australia (later known as the Returned & Services League of Australia), local citizens and the shire council. After the First World War the Mechanics Institute needed new premises for a library and reading room, the RSSILA wanted clubrooms and the citizens of Jeparit needed a public hall. 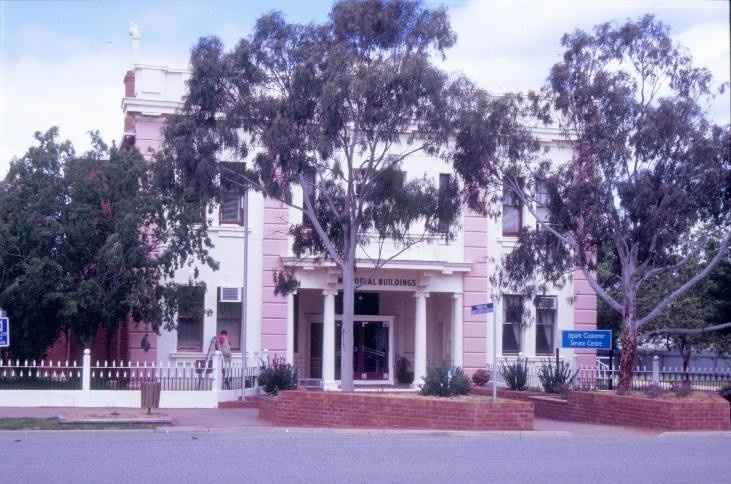 A committee made up of "soldiers and citizens" approached the shire council, who were planning to build new offices and chambers, with the idea of a combined building. 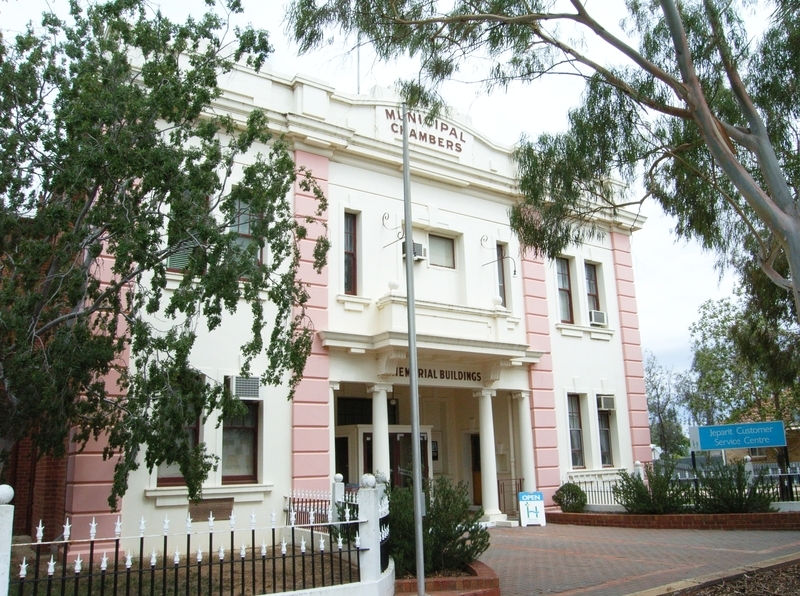 The administrative centre of the Dimboola Shire had shifted from Dimboola to Jeparit in 1914 after years of increasing discontent in the northern section of the shire. The committee raised the equivalent of approximately £4000 in cash and land and the shire council provided the remainder of the funds. The Ballarat firm of architects Clegg and Morrow designed the building and the local firm Lovell Dudden and Jones were the builders. The contract price was £7700 with about £400 for extras. On 5 February 1924 the foundation stone was laid by the Hon. Arthur Rodgers, former Minister for Trade and Customs and former assistant Minister for Repatriation. The building, a memorial to those who fought in the war, was opened on 2 June 1925. It is a two-storey red brick building with rendered front facade, Ionic order columns to the recessed porch and trabeated treatment to the facade. The ground floor comprised a library and reading room, soldiers' lounge and meeting room, billiard room, public hall with stage (later used as a cinema), dressing room and supper room. 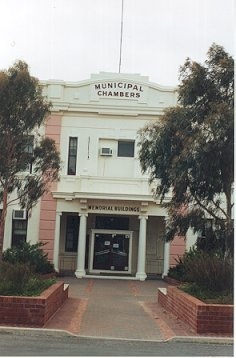 Upstairs was occupied by the shire offices and chambers. The local furniture maker Chaplin made chairs and a large timber table for the municipal chambers which was assembled in the room. 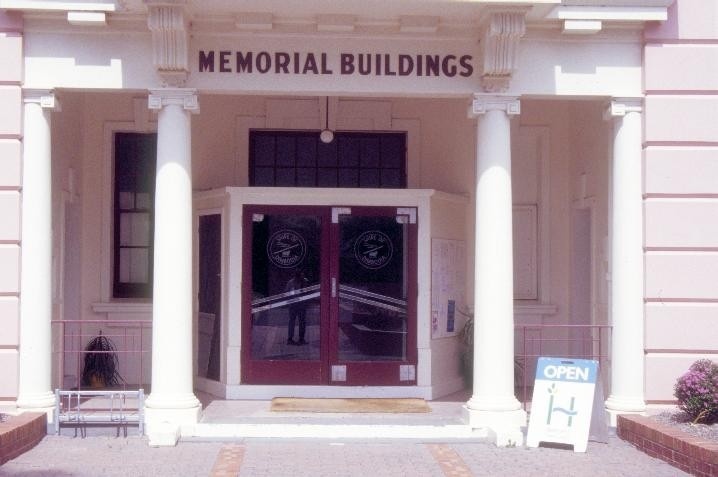 The Jeparit Soldiers' and Citizens' Memorial Hall and former Municipal Chambers is of historical, social and architectural significance to the state of Victoria. The building is of historical and social significance as one of a small group of shire buildings dedicated as World War I memorials. 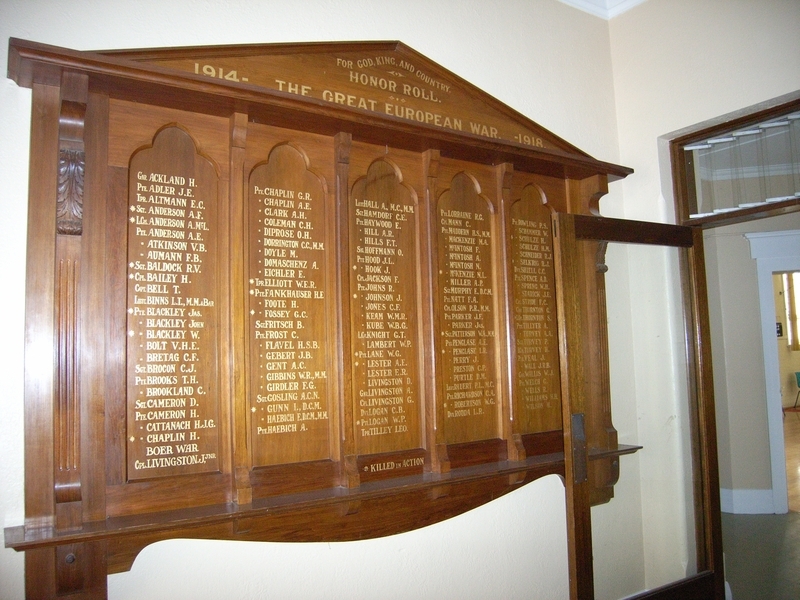 Other memorial halls include those at Boort, Kerang, Donald and Leongatha, regions with extensive soldier settlement. The dedication of a key building in the town as a war memorial is a tangible reminder of the profound impact the First World War had on Australian communities, made more poignant in this context as the shire included many people of German origin. The building has historical significance as a rare example of a municipal building designed for a multi-purpose use as municipal offices and a community facility. 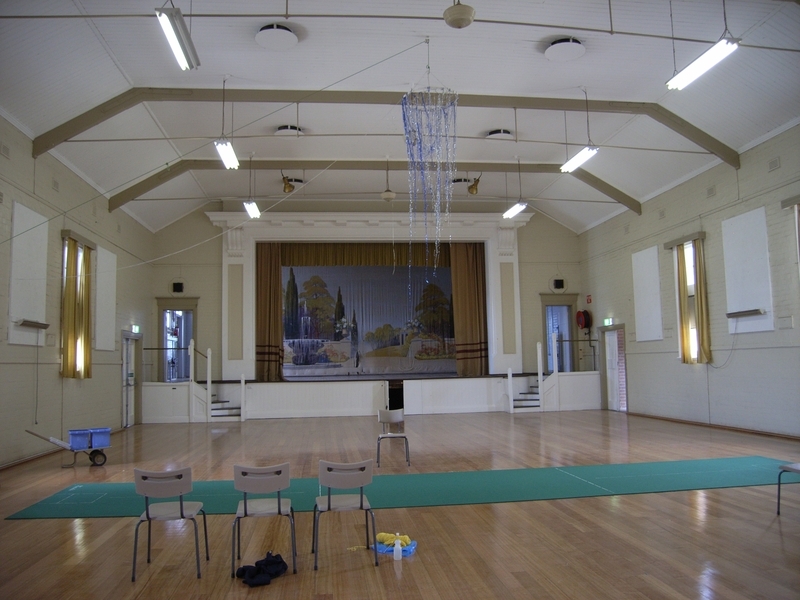 Although there are a number of examples with multiple public uses such as the Buninyong Town Hall which combines a town hall and courthouse, the mix of civic and community use is more unusual. The building has social significance for the high value placed in it by the local and surrounding community. It has long played an important role in community life and, more widely, in the former Shire of Dimboola as a place of decision making, entertainment, learning and meeting. The impetus for the building came from the local "soldiers and citizens", highlighting the importance of such a facility for an isolated rural community. The building has architectural significance as a fine, essentially intact example of an Inter-War Free Classical style building. It has classical elements but also references to the Moderne style with the stylised keystone detailing around the windows. The building retains original furniture and fixtures including the fine timber staircase, strong room in the former rate collector's office, the large board room table and chairs in the municipal chambers built at Chaplin's furniture factory in Jeparit and assembled in the room, purpose-built chairs with rising sun motif in the RSL room, scenery back drop to the stage painted by Edgar Finlay, plaques and honour boards throughout the building. Three honour rolls located in the ground floor corridor (Life Members, Past Presidents and World War I). Scenery backdrop painted on cloth, c.1925, located on the stage. Five timber chairs (two with arms) and one table, c.1925 located in the RSL Room. One large timber table, c.1925 located in the former Municipal Chambers. Five timber chairs with leather inserts, c.1925 located in the former Municipal Chambers. 3. All of the land marked L1 on Diagram Number 1905 held by the Executive Director being all of the land described in Certificate of Title Vol. 4782 Folio 360. The Soldiers' and Citizens' Memorial Hall and former Municipal Chambers is a two-storey Classical Revival Inter-War building with Ionic order columns to the recessed porch and trabeated treatment to the facade. It is a red brick building with a stuccoed front facade, originally unpainted but now painted. The ground floor includes a fine timber staircase, World War I and II honour rolls and past presidents' honour board in the corridor, RSL rooms on the ground floor with original furniture, a large room used by the Senior Citizens' Club with a library at one end and billiard table at the other, a large hall with stage retaining its proscenium arch and a stage backdrop and a supper room to the rear. Upstairs there are offices formerly used for municipal purposes, a built-in W. Willis and Co. safe, a bio-room used for the projection of films and the municipal chambers with original furniture including a large timber table built with drawers for each councillor and chairs made by the local furniture maker Chaplin's. There is a small extension at the rear accommodating toilets and a kitchen. Good condition, apart from some cracking evident in some interior walls and the brickwork. The interior and exterior of the building display a high level of intactness. A window above the front porch has been built-in and a small window inserted, as well as an air conditioning unit. The building, now painted, was originally unpainted. Service spaces in the rooms (includes senior citizens' room and RSL rooms) appear to have been refitted in the 1950s-1960s. The Jeparit Soldiers' And Citizens' Memorial Hall and Former Municipal Chambers are located at 10-12 Roy Street. 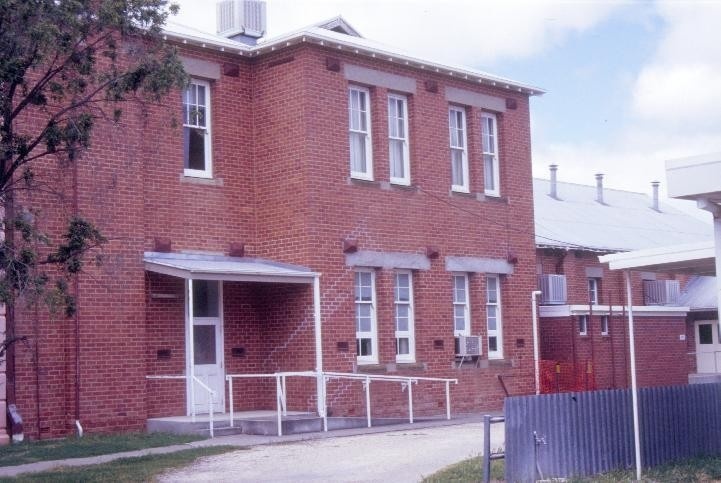 The municipal building at Jeparit was a combined effort of the Mechanics Institute, the Returned Sailors and Soldiers Imperial League of Australia (later known as the Returned & Services League of Australia), local citizens and the shire council. After the First World War the Mechanics Institute needed new premises for a library and reading room, the RSSILA wanted clubrooms and the citizens of Jeparit needed a public hall. 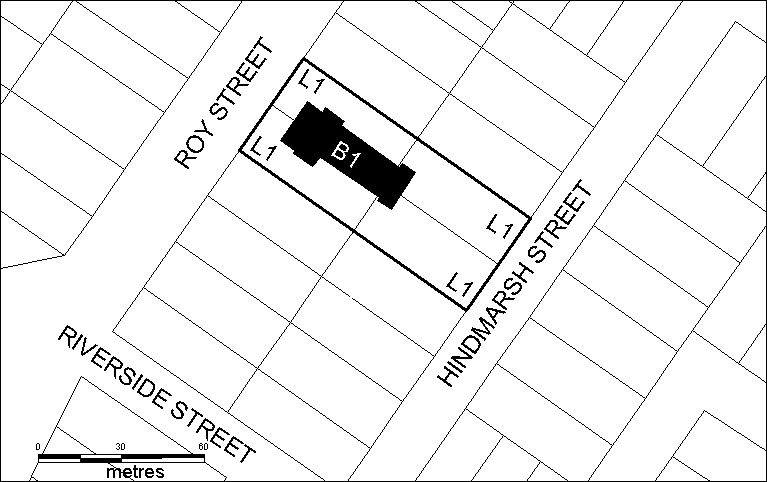 A committee made up of "soldiers and citizens" approached the shire council, who were planning to build new offices and chambers, with the idea of a combined building. 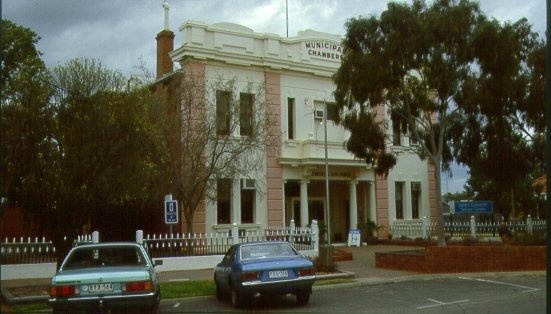 The administrative centre of the Dimboola Shire had shifted from Dimboola to Jeparit in 1914 after years of increasing discontent in the northern section of the shire. The committee raised the equivalent of approximately £4000 in cash and land and the shire council provided the remainder of the funds. The Ballarat firm of architects Clegg and Morrow designed the building and the local firm Lovell Dudden and Jones were the builders. The contract price was £7700 with about £400 for extras. On February 5th 1924, the foundation stone was laid by the Hon. Arthur Rodgers, former Minister for Trade and Customs and former assistant Minister for Repatriation. The building, a memorial to those who fought in the war, was opened on June 2nd 1925. The building is an intact example of an Inter-War Free Classical style building. It has classical elements but also references to the Moderne style with the stylised keystone detailing around the windows. 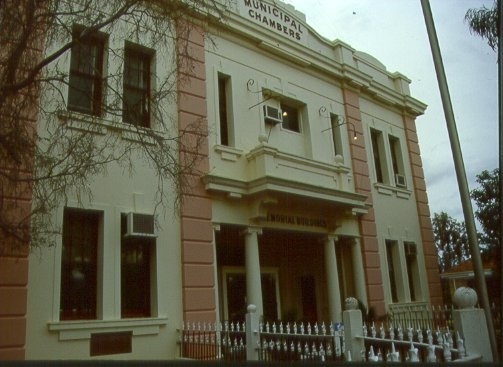 The building retains original furniture and fixtures including the fine timber staircase, strong room in the former rate collector's office, the large board room table and chairs in the municipal chambers built at Chaplin's furniture factory in Jeparit and assembled in the room, purpose-built chairs with rising sun motif in the RSL room, scenery back drop to the stage painted by Edgar Finlay, plaques and honour boards throughout the building. 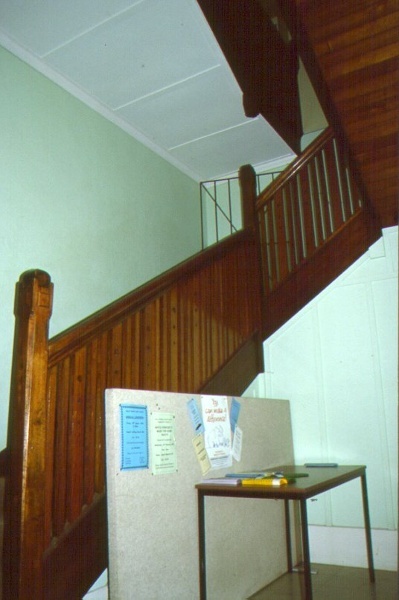 The ground floor includes a fine timber staircase, First and Second World War honour rolls and past presidents' honour board in the corridor, RSL rooms on the ground floor with original furniture, a large room used by the Senior Citizens' Club with a library at one end and billiard table at the other, a large hall with stage retaining its proscenium arch and a stage backdrop and a supper room to the rear. The cultural heritage significance of the Soldiers and Citizens Memorial Hall and Municipal Chambers, Jeparit is principally due to its historical and social associations. /nThe exemptions policy recognises that although some alterations have occurred, the building retains a high level of integrity. Important elements include original furniture and fittings, in particular the table and chairs in the municipal chambers, the RSL furniture and the scenery backdrop on the stage. Further upgrading of service spaces will take place in the future. The purpose of the permit exemptions is to allow works that do not impact on the significance of the place to occur without the need for a permit. Alterations that impact on the significance of the exterior and interior are subject to permit applications.